Last evening I began the tedious process of packing my earthly belongings in preparation for my move to Virden on September 12th, beginning with my library. As I promised the high school students when I first told them of my transfer, I am offering church service hours to those who help me pack. Three of the students took me up on the offer last night. We packed books for about an hour and a half and are only half-way through the books in my library. I still have other books in my sitting room and in my library. It seems I am going to need for boxes for books that I anticipated. I would have liked to pack my library last, but I need a place to put boxes once I begin packing my living quarters and the library seemed the best place in the rectory to do so. Yesterday afternoon the Pastor asked me to take his classes today with the seniors so he could be with his family. I happily agreed. Today I am to cover the first chapter of their textbook. Since I have a copy of the book I told him I would not need his book. I thought I had the book on my shelf in my office. I know that I did at one time, but I must have sometime moved it into the my library in the rectory. Naturally enough, when I went looking for it a few minutes ago I found that I must have packed it last night. Oops! Fortunately, the Pastor left his book on the floor in his office where I easily spotted it. I have made a copy of the first chapter and am now ready for class. If the course of my life – in its many joys and sorrows and successes and failures – has taught me anything, it has taught me this: the Lord will never abandon his people. It is this confidence in the Lord’s loving care for his faithful ones that has helped me to abandon myself to the Lord’s will time and again throughout the heartaches and pleasures of life. It is this same confidence in his grace and mercy that enabled me to abandon myself to his will on the day I was ordained to the priesthood of Jesus Christ. It is this same confidence in his providential care that has made me able to abandon myself again to his will as I prepare to receive the office and duties of a pastor this coming September 15th. The abandonment of ourselves to the will of God must often be done again and again. Once is rarely enough; rather, a daily – and even hourly – abandonment of our will to his must be made if we are to grow in holiness so that we might know lasting joy and peace. We may not always understand the Lord’s ways, but we do not need to understand his ways all of the time, because of the confidence we have in him. We know that his ways always lead to our good. If we but trust him, his plans always lead us to himself and to our growth in faith, hope and love. My dear friends, when I was ordained to the priesthood, the Lord anointed me – as he does all his priests – through the hands of then-Bishop Lucas, “to bring glad tidings to the poor,” to those whose hearts yearn for the truth, for the love of God (Isaiah 61:1). He sent me first here to you; now he sends me to announce these same tidings to another flock. I have told you before that that these past four years among you have been filled with many joys and blessings. I cannot adequately express my affection for you or my heartfelt gratitude for all you have done for me. I have grown these past four years in ways I would never have imagined or thought possible. My faith has deepened as I witnessed your faith and known your love. Thank you for being patient with me and for the many ways you have supported and encouraged me in my ministry to you. May the Lord reward you for your kindness! To those whom I have offended, for whom I did not offer adequate pastoral care, I beg your forgiveness and prayers. I am sorry for my personal failures and flaws, and I ask you not to hold them against the Lord or his Church. I seek to be his humble instrument and sometimes my sin and pride get in the way of his grace. Please, forgive me and pray for me that by his grace the Lord will correct my flaws to use me more and more for his glory. Looking back over these years, I can only sigh a prayer of humble thanksgiving to God for having placed me here among you. This parish will always hold a special place in my heart. I am indebted to Monsignor Enlow. He has been, for many years now, a trusted advisor, a wise and learned mentor, a brother in Christ and a friend. I will miss his counsel and his faithful sidekick, Molly, who lay under my desk as I penned these words. To the parish staff and the various councils, I must also express a word of gratitude. I have learned much from them about the day-to-day affairs of a parish and they have tolerated my ignorance and forgetfulness on more than one occasion, always with much support and encouragement. But to the youth of the parish I am especially indebted, and to them I wish to address a few words. From the outset of my arrival you have welcomed me not only as a priest, a spiritual father, but also as a brother and a friend. My ministry among you has borne much fruit because of your openness and your willingness to be challenged by me and to challenge me both in my attempts to explain the faith to you and to grow in my own life of prayer. For this, and for your friendship, I am deeply grateful. I ask you to welcome Father Joseph, who will soon come to take my place, as you welcomed me. My dear young friends, with your zest for life, with your idealism and enthusiasm, the field of your souls is ripe! The Lord wants to use you, to use your energy, your excitement, and your overflowing love, to bring his Gospel to all people. What is more, the Lord Jesus thirsts for your love even as you thirst for his! Always acknowledge this thirst, this yearning for something more, this desire for meaning and contentment in life. You will only find it fulfilled in the love of God! Do not look to the things of this world that promise to satisfy but never do! Look instead to the figure of Crucified Love who calls out to you, “Remain in my love” (John 15:9)! The commandments of the Lord are not given you to stifle your freedom or to keep you from the things that make you happy, but so that his “joy may be in you and your joy may be complete” (John 15:11). In Christ alone - and in his plan for your life - will you find that which will satisfy the deepest desires of your heart. Do not be afraid to abandon yourselves to him! He has never disappointed or abandoned me, and he will never disappoint or abandon you! If you abandon yourself to him he will give you all that you seek! Trust in him, and draw close to him as to a dear friend. Dear brothers and sisters, the great playwright and poet William Shakespeare once wrote, “parting is such sweet sorrow.” The sorrow of parting is sweet because it calls to mind the love that has been shared in the meeting. Such a sweet sorrow cannot but remind us of the many blessings the Lord has given us, filling us with gratitude even as we prepare to part ways. I hope that all I have done here among you – the classes I have taught, my time with the athletic teams, dinners here and there and everything else – has always led you here, to the altar of God. It is here the Lord will satisfy the desires of our hearts. As we are nourished with his Body and Blood he calls us his friends and unites us all together in him. In this way, whatever the physical distance between us, we are always very near to one another at the altar of God. I do not wish to say “Good bye” to you because it seems too final. Rather, with a heart welling up with gratitude, in the words of Bilbo Baggins, I bid you a very fond farewell, trusting the Lord will bring our paths to cross again. Until that day, my friends, I beg you to pray that the Lord’s “hand may be always with [me], and that [his] arm will make [me] strong” (Psalm 89:21). Pray that the Lord equip me “for the work of ministry, for building up the Body of Christ” (Ephesians 4:12). But above all, pray that I will be a good, holy and zealous pastor of the Lord’s flock that will soon be entrusted to you. Until we meet again, “may the Lord be with you always and, wherever you are, may he be with you always.” Amen! This evening one of our high students called me to debate with him and another student about free will, determinism and the problem of evil. We had a good conversation but I can't seem to explain free will and God's omniscience well to him. He does not accept free will and calls himself a determinist. He is also very open to reading books on this subject and has a good, intellectual mind. Can you recommend any books on these topics, particularly that address free will and God's knowledge? The Reverend Monsignor Carl Kemme, Administrator of the Diocese of Springfield in Illinois, has designated this weekend as days for prayer for the election of a new Bishop. This weekend St. Anthony High School hosts a soccer tournament, beginning this afternoon and lasting through tomorrow evening. I fully expect our boys to do well in this tournament. They have worked hard this summer and are in much better shape to play - both physically and mentally - than I've seen them before. Facebook statuses clearly show the boys are playing this weekend for Coach K and they'll be wearing wristbands in his memory. I'm very proud of them and wish them well. If you're in the area and are free, please come out and cheer us on! Canonist Ed Peters considered if the late Senator Kennedy should be accorded a Catholic funeral. A minor friar considers what should happen at the end of a confession. When I awoke this morning I had every intention of posting something insightful about Saint Monica, but the day got away from me and now - to be quite honest - I don't quite feel like doing it, with no disrespect meant to the mother of the Doctor of Grace. Instead, I'll give you a recap of yesterday and today. After celebrating Mass yesterday morning, I saw to a few details at the high school and then drove to the See City to meet with the director of the Office for Human Resources. She talked with me about hiring employees, the safe environment program and other such details. It was a good visit and she offered some helpful suggestions. On an aside, "human resources" is a phrase I've never liked. People are not "resources;" they are people, and should be treated as such. Such an office would be better titled the Office for Personnel, or some such thing. After meeting with her I met with my "Pastor Mentor." He is a good friend of mine and a former pastor who will meet with me periodically as I take up my first pastorate to listen to me and to offer his advice and guidance. It is a relationship that I look forward to deepening over the years. I around in Springfield a bit for herbs de Provence. I want them so I can try a chicken in a lemon cream sauce over a pasta but, sadly, could not find them in Springfield. I suppose I'll have to look online. When they first talked about it I wasn't sure what I thought of it, but seeing it I really liked it. After practice I wrote a few thank you notes and went to bed. After Mass this morning I had a radio interview about a variety of topics. When I returned to the office I wrote a few more thank you notes saw to a few arrangements to my trip to Rome in October for the canonization of Father Damien. I visited with a parishioner for a while who wanted to see me before I move to Virden. After our visit I had lunch with two other parishioners who wanted to see me. I returned to the office for more thank you notes and correspondence and I briefly touched base with the priest who will take my place here to give him two weddings on my docket. 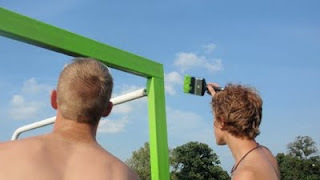 At soccer practice we learned that we, unfortunately, had to paint our goals white and so we lost the green color about which we were all excited. Since we play our first game of the season tomorrow, some of the parents hosted a pasta night for us which I followed with a brief meeting with a couple seeking to be married. They've been two full days one after another. Tomorrow, I hope to write my homily for the weekend and take a bit of a quiet day. The return of the academic year has left me thus far little time at the computer, as you might have noticed by the lack of posts in recent days. Yesterday, for example, I taught three classes of juniors about the Eucharist after celebrating the 6:30 a.m. Mass. I'm happy to say that the students - for the most part - listened well and asked good questions. I enjoyed the classes quite a bit. There was an open period between two classes so I ran an errand and worked on thank you notes in the high school office. After my last class I went outside to help one of our teachers grill hot dogs and hamburgers for some of the students to eat at lunch. During lunch the chess club - which I sponsor - met for a good game of Chess 4. As I was about to leave the high school to return to the parish office after lunch, I was called into a study hall to play another four-way game of chess. It was an invitation I was happy to accept. Unfortunately, I was easily distracted during the game visiting with students and was knocked out of play rather early. I then made my way to the parish office to do a bit of working before lifting weights. In the weight room I had a good conversation with a couple of students about stresses and strains in relationships with parents, especially as children grow older and desire more freedom and independence, even as mothers particularly still want to nurture their children and not let go. We also talked about the way things are said and the way things are heard. Afterwards it was time for soccer practice, followed by a quick dinner. I then attempted to go to a meeting of the Board of Education, which was held in the new grade school. I could enter the lobby of the school, but since entrance to the office requires an electronic card that I haven't been give, I couldn't enter the office (I was late for the meeting because of practice). Now, I was terribly disappointed about this. Since I couldn't go to the meeting I went back to my office, made a few phone calls and called it a day. All in all, it was full day and a good one. It's a good way to brighten a Monday. 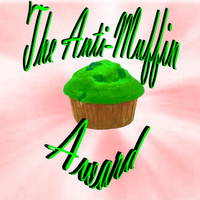 ...The Anti-muffin Award by Sarah, who recently moved to my beloved Hawaii and blogs at So...This Is The Road I Am Travelling On (she has a great header picture). This award is given to bloggers who "promote what they believe without hesitation and without fear of possible negative feedback." Awardees are bloggers "who don't conform to the world's standards." One day last week after soccer practice two of the boys hung around the field and chatted with me for a bit. At the end of our conversation they suggested - none too subtley - that I make dinner for them. Since it was already 7:30 p.m., and I had nothing else on the calendar for the evening, I agreed. I made them a smoked turkey with tomato cream sauce over fusili, which they thoroughly enjoyed and are still raving about. Naturally, the word spread to some of the other players, three of whom have decided that I should make them dinner tomorrow evening. I'm happy to do so, but I can't quite decide what to make. Do I make the same dish (which is easy to make and quite delicious) or do I make manicotti with meatballs (which I also very much enjoy)? Or do I make something I haven't made before, like a rigatoni all'amatriciana or a chicken in lemon cream over penne? If you were to dine with me tomorrow, what would you like me to prepare for you? For whatever reason, I have been awake since 3:00 a.m. I don't know why; I simply woke, and once I do there is rarely any sense in my trying to fall asleep again. So I did what any sane person would: bake. Today is the first day of school at both our grade and high schools, thought it is only a halfday. At 4:00 p.m., the soccer team from Eastern Illinois University will play a pre-season match here in Effingham in honor of Coach K, who died early this summer. The soccer team will be in attendance and will attend Mass afterwards to kick-off the new academic year. In a spirit of festivity, the boys decided that we should tailgate before the game. This idea being agreed upon by all with little discussion, we will gather about 1:30 for an afternoon of fun and food and, no doubt, a few games. Coach K, I think, would want it this way. At any rate, I told the boys yesterday that if I got ambitious this morning I would bake St. Francis' favorite cookies for them. I suppose that might well be why I awoke so early. I baked two batches using two different recipes. They both turned out a bit dry, though they still taste good; it's nothing a bit of milk can't fix! Having been up so long now you'd think I'd be able to make decisions, but I can't, it seems. I can't decide whether I want to wear my suit or cassock today. Oh, the tough choices of life! Once I decide, I'll head to the high school to greet the students and meet with a class or two. I'll also spend time in the office sorting through my mail and writing notes of gratitude. My apologies for not posting much over the past few days; laziness is the only real reason I can offer, so I thought I'd give you a run down of my day and a thought to ponder. The day began with soccer practice at 6:30 a.m. While the boys did their runs both on the field and around time, I walked around the track praying the office. It was a beautiful morning and a very good experience. I left practice a little before 8:00 to prepare for the 8:30 Mass. After Mass I had the first confession of a student at our grade school so he can recieve his first Holy Communion at Mass tomorrow with the grade school. He made an excellent confession and it was a real privilege to administer the sacrament to him. Since the rest of the day was very free - and since tomorrow is the first day of school, which means fewer open days - I drove to Springfield in hopes of finding a Nintendo Entertainment System (the original) and The Legend of Zelda (and a few other games). I was not disappointed. I returned to Effingham about 4:00 and saw to a bit of office work before heading back out to soccer practice. I ran a bit with the boys and did some of their exercises, which I'm sure I'll feel in the morning. After practice a few of us ate dinner at Buffalo Wild Wings, from which I have just returned. In today's Gospel, Jesus says, "It is easier for a camel to pass through the eye of a needle than for one who is rich to enter the Kingdom of God" (Matthew 19:24). What has a camel to do with a rich person? Both store up things. The camel stores up water, that which gives life, within itself. The rich person stores up earthly treasures around himself. Whereas the camel remains unburdened because it's store is within, the rich man is very much encumburdened. Because the camel's possession is interior he can pass through the eye of a needle more easily than a rich man can enter a gate because of the possessions that surround him and clog the artery. Like the camel, we must store up water within ourselves, Jesus Christ, the living water. If we store up this water, we, too, will move unhindered and enter to the Kingdom of God. Now I think it's time to play a little Zelda before bed and a full day. Thanks to the generosity of numerous individuals, Chelsea, the Soon to be Sister, has paid off all of her loans so that she may soon enter the Dominican Sisters of Mary, Mother of the Eucharist! I posted a plea for her here. The Crescat also recently asked for financial assistance and has expressed her gratitude to her kind benefactors. I posted a plea for her here. Let us remember to keep those who are good to us in our prayers asking the Lord to reward them for their goodness, while never neglecting to pray for those who are bad to us. With only four weeks remaining in my present assignment as the Parochial Vicar of St. Anthony of Padua parish here in Effingham, the time has come to begin saying my farewells. This evening the mission parish attached to St. Anthony's will host a dinner and reception in my honor. The parishioners there wanted to hold it on a day convenient for me and for them, and early enough so as not to interfere with celebrations here or with my packing and moving. They really are a very thoughtful lot. Though I have never enjoyed any canonical attachment to the parishioners of Annunciation Parish in Shumway, I have very much enjoyed ministering among them these past four years. I will miss them. This evening will be somewhat strange, because even as I will, using the words of Bilbo Baggins, bid them all a very fond farewell, I will still be with them for two more weekends. I do think it best this way, though, because such a celebration (?) will afford more time to visit with individual parishioners. After Masses there simply isn't time - or space, really - to visit one on one with parishioners beyond a simple - even if heartfelt - greeting. The next four weeks I expect to be a bit of a blurr and a whirl of emotions. The ancient believers saw in the Old Testament’s personification of Wisdom an image of Christ. So it was that Saint Paul declared this deeply held belief when he called Jesus Christ not only the “power” of God, but also “the wisdom of God” (I Corinthians 1:24). It is, then, Christ himself who extends the invitation from the Book of Proverbs to all people: “Come, eat of my food, and drink of the wine I have prepared” (Proverbs 9:5). Why, then, have so few answered his invitation? Better yet, why have so many who have come to the table he has spread left the wedding banquet of the Lamb, never – or only rarely – to return? It can only be because many of those invited have refused and rejected the food that is offered them. The table that Jesus Christ prepares for us is the Cross, where is priest, victim and altar. It is this sacrifice of Calvary that is sacramentally made present to us here at the altar of the Lord. The food he sets before us is the Eucharist, his very own Body and blood. The Lord Jesus calls himself “the living bread that came down from heaven, and he says, “the bread that I will give is my flesh for the life of the world” (John 6:51). Indeed, in the eight verses of the Gospel passage proclaimed today from the Gospel of Saint John, Jesus refers to the eating and drinking of his Body and Blood no fewer than seven times. What he says here is clearly of great importance. And yet there are some who say that in this passage he is speaking metaphorically, symbolically. There are even some who Catholics – most unfortunately and quite wrongly – say the Eucharist is nothing more than a symbol of his body and blood. My brothers and sisters, when Jesus says, “Amen, amen, I say to you, unless you eat the flesh of the Son of Man and drink his blood, you do not have life in you,” he is either a mad man, or what he says is true (John 6:53). There were many who heard his words firsthand who thought he was mad and so they abandoned him (cf. John 6:66). There are many today who think and do the same. That Jesus is not here speaking symbolically is clear from the Gospel text itself. Throughout this chapter, Jesus is repeatedly challenged with such questions as, “How can this man give us his flesh to eat” (John 6:52)? In response to this fair and justifiable question, Jesus does not relent or explain whatever supposed symbolism he may be employing. Rather, he speaks all the more insistently of necessity of eating his flesh and drinking his blood. The first two times he speaks of eating his flesh he uses the Greek word phage, a word meaning “to eat.” But once his teaching is challenged, he switches to another Greek word, trogon. This word does mean “to eat,” but it also means “to crunch.” He says, then, “he who crunches my flesh and drinks my blood has eternal life, and I will raise him on the last day” (John 6:54). Anyone who wishes to explain he is speaking symbolically would never use such concrete and vivid language in a situation such as this. No, the words Jesus speaks today show either that he is a mad man, or that what he says is true. After extending the invitation to his feast, he says, “Let whoever is simple turn in here” (Proverbs 9:6). The thoughts of those who are simple are not complicated or distracted, but focused. The one who is simple takes Jesus at his word, because he has experienced his grace and power, his love and mercy. He has seen the signs and wonders he has worked and so he knows his words to be true. He knows Jesus himself to be “the truth,” and that he can neither deceive nor be deceived (John 14:6). Saint Anthony of Padua proved himself to be a simple man who remained focused on Christ. One day he encountered a man who denied the reality of the Eucharist and challenged Saint Anthony to perform a miracle; if he did, the man would believe in the Eucharist. For the honor of God, Anthony agreed. The man said he had a donkey that he would starve for three days. After the three days he would bring his donkey to the town square where it would be presented with a stack of food and with the Eucharist. When the day came the donkey walked past its food and knelt before the Eucharist before it returned to its food. Seeing the reverence of the animal, the man was brought to faith. There is another simple young man – or perhaps an old boy – whose feast we will soon celebrate: Saint Tarcisius, a martyr of the third century. 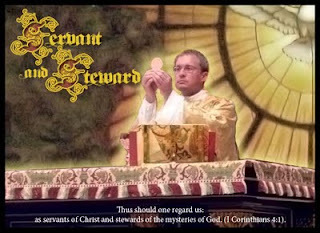 He was carrying the Eucharist to those who were sick and were imprisoned for the faith. He encountered a mob who, when they discovered he carried the Eucharist, beat him to death with clubs and stones. He shielded by the Eucharist by laying over it face down. When his attackers rolled him over once they had killed him, they found that the Eucharist vanished. We see in a great myriad of ways the faith of the saints in the Blessed Eucharist and if we consider the words of the Mass we find its truth, as well. The priest lends his voice to Christ in such a way that it is Christ himself who celebrates the Mass and gives the Eucharist to us. The bread and wine are changed into his Body and Blood by the power of his own words. But if your faith in the Eucharist is still shaky, there is one simple remedy: spend time in the presence of the Blessed Sacrament. Time and again those who enter the Church through the Rite of Christian Initiation of Adults provide the same answer when they are asked what led them to the Church. Very often they say they stopped into a Catholic church once and found it be the most peaceful place they have ever found. It is true. In the presence of the Blessed Sacrament is a stillness, a quiet, a calm and tranquility that can be found nowhere else in the world. Simply stop in a church and spend a few minutes with the Lord. If you thoughts are simple and focused on him, you will know the peace he longs to give us. Let each of us this day be of simple minds, focused only on the words of the Lord. Let us approach the food he offers, his own Body and Blood, with great reverence and love. Let us receive the gift of himself in humble faith, that we might know the joy he has prepared for us beyond our imaginings (cf. Collect of the day). You may have noticed there is now an image in the header box of this blog, courtesy of reader, Jake. It is an altered version of the image I posted yesterday. Thanks, Jake! The background image is taken from the window of the Holy Spirit in St. Peter's Basilica. The picture of me was taken during the Mass when I announced my transfer to the high school students. When I was in high school I was a member of the Quincy Astronomical Society, which, sadly, is no longer is existence. The QAS met on a monthly basis to discuss various aspects of astronomy. One of my favorite presentations was on meteorites (including a member's special collection of them); my favorite memory took place August 11 (probably in 1995) just outside of Quincy on Friends' Hill. Every August 11 and 12, star-gazers can watch the brilliant Perseid meteor shower, also known as the tears of St. Lawrence. We spent the night laying on the grass gazing heavenward watching several meteors shoot across the sky at a time. If you've never seen the Perseids, you really must make a point to watch the shower next year. At one point there was a bright flash of light behind us, as it were. We quickly turned around in time to see a huge ball of fire shoot across the heavens. The tail of the meteor lasted several minutes and was a long as the distance between the tip of your thumb and index finger; it was simply amazing and the sight remains with me to this day as one of the most beautiful things I have seen. Last night I went out to our mission church and watched a bit of the meteor shower behind the church. 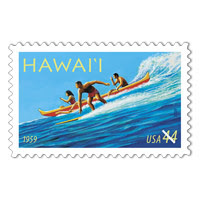 I haven't really looked into the heavens since I was last in Hawaii when I spied the Southern Cross. Whenever I look into the night sky I always call to mind the words of King David: "When I see the heavens, the work of your hands, the moon and the stars which you arranged, what is man that you should keep him in mind, mortal man that you care for him" (Psalm 8:4-5)? If you've never meditated upon this verse while looking into the stars, you really should, and the sooner the better. If you have access to a boat, I especially recommend doing so from the middle of a body of water. As I lay on the ground last night with slightly chilly toes, one of the high school studens who was watching the meteor shower texted back and forth. I mentioned that big ball of fire I saw when I was his age and I said it felt something like I was waiting for the Great Pumpkin (it seems to be on my mind lately; I'll suppose I'll have to watch it soon). Imagine my utter shock when he had no idea what the Great Pumpkin is! Parents, it's time to show your children the classics! Old I must be growing. A priest is a holy man. A priest forgives all things. The heart of a priest is pierced, like Christ's with the lance of love. The heart of a priest is the trysting place of human and divine love. A priest is a man who has crucified himself so that he, too, may be lifted up and draw all things to Christ. A priest is the gift of God to man and of man to God. A priest is the naked sword of God's mercy. A priest is the hand of God's mercy. A priest is the reflection of God's love. Nothing can be greater in this world than a priest, nothing but God himself. Our good blogging friend, The Crescat, is in need of help, if you can offer some. Her blog provides at least one good chuckle everyday. Please keep her in your prayers. For the second day in about three weeks, my joints feel well enough to go for a walk, from which I have recently returned. It is a beautiful day here in Effingham, with blue skies, a nice breeze and warm - but not hot - temperatures. It is really a very pleasant day. Whenever I go for a walk I like to have a destination in mind (I'm the same way with driving), so I often will walk to a store to collect an item or two. Today I walked to the drug store, which ends up being about a forty-five minute round-trip walk. A minor friar has a great little story today involving incense and a good dose of ecclesiastical humor. This past Saturday morning marked the third annual Bulldog Challenge, consisting of either a 2-mile run or a 5k run (walkers are also permitted). The forecast called for a very hot day. Fortunately, though the day was warm, there was a nice breeze to keep the excessive heat away. I walked the 5k with one of the soccer players who hurt his knee at a recent practice. As we set out he said to me, "My only goal is to finish before you." When we arrived at the end of the course we were to walk through a set of sensors so a computer could mark our time. There were what looked to be a series of sensors set up and as I entered the sensor area, I turned to the soccer player and asked, "Do you want to go through first to finish first?" But as I said, "go through" a loud buzzer sounded signally that my time was marked. Oops. One of our parishioners took some excellent pictures of this year's Bulldog Challenge. Saturday evening saw the beginning of our parish picnic, which continued through late Sunday night. As I have done the past two years, this year I again purchased raffle tickets in the name of Pope Benedict XVI. One of these years he will win a grill and I'll have to present it to him. Maybe that year will be next year! There once was a time when I thought I would not want to hear the confessions of close friends. Most of us already know the major faults of our close friends, but to know those things which are between them and God seemed too much to bear. Such is no longer the case for me. I am happy to know some of the high school students rather well and to count them as friends. I am certain these friendships will continue over the years, even after my coming move. Over the past few days I have heard the confessions of a few of our students. When they want to go to confession they simply call or text me and we arrange a time. It is an easy and convenient system for all involved. This conversation was deeply humbling. They are not afraid to seek out a priest whom they call a friend to confess their sins to; why should a priest, then, be hesitant to hear the confessions of his friends, young or old? Is this really not what friendship is about, leading one another closer to Jesus Christ and helping each other on the path of holiness? There is certainly no better way to help one another than this. We do not generally remember what people confess to us. We might recall what sins were named; we might recall who entered the confessional; but we are not always able to match the two. Really, who would want to? You enter the confessional to get rid of your sins; why would the priest want to keep them? But even if we do happen to remember a person’s sins we are forbidden to treat them any differently after the confessional than before. How is this possible? In human terms, it likely isn’t, except for the most noble of souls. In spiritual terms, though, it is not too difficult at all. Remember the grace of forgetfulness. I have found that when I do remember an individual person’s sin, I don’t remember it when I am with that person. I may remember the sin once the person has left my presence and then I offer a prayer for him or her. It is a wonderful gift! Can you help a future nun? Chelsea, the Soon to be Sister and one of our blog readers, needs your help. She has been accepted by the Dominican Sisters of Mary, Mother of the Eucharist, but needs to pay off $14,689 in student loans before entering the Order. She has already made a good start toward paying back her debt and needs your help to finish by the memorial of Saint Augustine, August 28th. Her debt is the only thing standing in her way. She needs to either have it paid off or promised to be paid off within the next eight years. If you have a few extra dollars, please consider giving her a hand. Please also encourage others to consider her request. If everyone gives a little her debt will be gone in no time. PBS' Religion and Ethics Newsweekly has a good video about Blessed Damien of Molokai and the leper colony. Capello tip to the Leper Priest Blog. You posted a question in my comment box the other day that I wish to address but, as it is a personal matter, do not wish to do so publicly. However, I cannot send an e-mail to the address you left (I'm told the account does not exist). Would you please send an e-mail to daren[at]servantandsteward[dot]org so I might assist you? Thanks! One of my favorite movies from my childhood is The NeverEnding Story, based on the book of the same name. My aunt first introduced me to the book and it is one that I have enjoyed ever since. At the beginning of the movie, Sebastian takes The NeverEnding Story into the school attic and lies down to read it on the floor. It is a scene that I've always remembered and call to mind whenever I plop down on the floor, pull a cover over me and open the pages of a good book. To this day, it is one of my favorite positions in which to read, though it does get sore on the elbows after a time. This morning I have felt very much like Sebastian. I awoke to a very heavy fog which has sapped much of my strength and energy, though I am beginning to feel better as the day progresses. I've spent the morning on the floor with my laptop and telephone (thank the Lord for long cords!) seeing to various correspondences, an activity which I think will continue a bit longer. I've rescheduled a couple appointments from this morning for later this week and next and hope to be able to keep an appointment at 1:00. This evening a friend and I are heading north to Mundelein Seminary to show him the campus. We will return to Effingham tomorrow night and since we have to pass through Chicago on the way home I thought we might stop at a museum. I see that the Field Museum has an exhibit on "Real Pirates: The Untold Story of the Whydah from Slave Ship to Pirate Ship." Has anyone seen it? Is there an exhibit at another museum we should visit? In the midst of the grateful comments have been one or two - not very many, too be sure - that questioned something I said. In fact, I expected this because it seems to happen everytime a priest mentions that we should dress, as I said, "appropriately and modestly" for Mass. To be sure, those who question what I said, or how I said it, mean no disrespect to me and I mean no disrespect to them. To help further this discussion I want to put something together about worship the Lord "in holy attire" (I Chronicles 16:29). This is where you come in. I need your help in summarizing the common reasons given against dressing up for Mass offered by those who are sincere in their faith so that I might try to address them point by point. This coming weekend marks the celebration of the annual parish picnic, no small fair around here. For many, it is used to occasion a sort of homecoming to Effingham. Anyone who has ever worked on the organizing end of an event of this sort knows that the week leading up to the event is always marked by a flurry of activity and distracted minds. The office tends to be chaotic, as proved to be the chaos when I popped over after Mass this morning. Ordinarily I don't mind such activity, but this week I don't think I will enjoy it too much (I'm not sure why). With this in mind, I fully intend to spend as little time in my office this week as possible and will see to my office work in my sitting room, where all is calm and peaceful. I have also been asked to consider a slot in the dunking booth this year as I prepare to leave the parish. There is no doubt that my doing so would raise considerable funds; even so, I'm not sure about it. Incidentally, if anyone is interested in purchasing raffle tickets for our picnic, I would be most happy to assist you. Simply shoot an e-mail to daren[at]servantandsteward[dot]org. The first reading at Mass today comes from the Book of Numbers and concerns the manna that came from heaven to feed the Israelites in the desert. 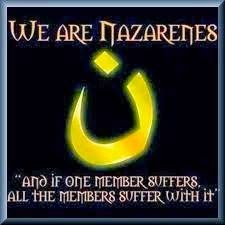 We are told that the people "would grind it between millstones or pound it in a mortar, then cook it in a pot and make it into loaves, which tasted like cakes made with oil" (Numbers 11:8). There are, I think, two messages we can learn from this passage. First, the Lord will indeed meet our needs, but he may require us to work with him to do so. The manna did not fall from heaven in the form of loaves, but the people had to form it into loaves. Too often we expect the Lord to do all of the work for us, when instead he wants us to cooperate with the grace he gives. Second, we ought to humbly accept the gift of the Lord. The people grew tired of this manna and said to Moses, "Would that we had meat to eat for food" (Numbers 11:4)! The Lord supplied their need for food with the manna and yet still they demanded more. Rather than receive his gift with gratitude they demanded more.